Boston Newborn Photographer, Boston Children's Photographer, Award-winning Boston area Family Portrait Photographer and Photojournalist - Paula Swift Photography in Sudbury, MA. Celebrating 24 years in 2019 as a professional photographer- Paula Swift is a Master Photographer, Photographic Craftsman, Certified Professional Photographer, specializing in newborn, baby, children, family, maternity, high school seniors and engagement photography.2018 Bronze Medalist in her Newborn Photography at the Professional Photographers of America International Photographic Competition. 2014 Professional Photographer of the Year - Bronze Medalist by the Professional Photographer's of America. Voted as Boston's Best Family Photographer, finalist for the Pulitzer in 2000 for a staff entry at the Worcester Telegram & Gazette for her coverage of the Worcester Warehouse Fire in Feature Photography, winner of two Kodak Gallery awards, Hallmark Gallery award and many Loan and General Collection winning enteries at the Professional Photographer's of America International Photographic Competition. 2018 Bronze Medalist for her newborn photography at the PPA's International Photographic Competition. Paula has been featured as one of Boston's Best Family Photographers by CBS Boston in 2015. Paula Ferazzi Swift owner of Paula Swift Photography, Inc announces her book STORYTELLING PORTRAIT PHOTOGRAPHY BOOK is available Amazon now. Paula's book will show her favorite storytelling children and family photographs while telling the story behind how she captured them. Click on the image above to view the book and order. 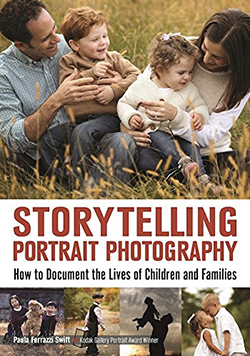 Paula's Book on Storytelling Portrait Photography has been featured as Amazon's #1 New Book Releaase in Children's Photography and Lifestyle Photography. Paula Swift Photography offers Newborn, Baby, Children, Family, High School Seniors, Couples and Corporate Photography to clients in Boston, Metrowest and Massachusetts. One of the few award-winning photographers in the area with a professional commercial photography studio located in Sudbury MA on Rt 20. Beach sessions are offered in the summer months of July and August in Boston areas and Southern Maine. Please inquire at least 4 weeks in advance to book your session date. Offering photography sessions outdoors, in her beautiful Sudbury photography studio, on location throughout Metrowest, Boston or in the comfort of your home and yard. VOTED BOSTON's BEST FAMILY PHOTOGRAPHER BY NICKELODEON'S parents connect. Paula Swift Photography on Facebook! Become a fan! Paula Swift Photography on Twitter! Follow our tweets! Welcome to the award-winning Paula Swift Photography, Inc. of Sudbury, Massachusetts: Photographer, Paula Swift specializes in unique photography portraits of your newborn, baby, child, pregnancy, high school senior, and family, as well as offering couples and engagement photography. Paula Ferazzi Swift is also well known as an Editorial and Commercial photographer in MA as she was a Photojournalist for 10 years at the Worcester Telegram and Gazette, a New York Times Company. Paula Swift Photography , Inc. offers beautifully lit maternity portraits in Massachusetts, newborn photography in Boston, fun children portraits in Metrowest Boston and Worcester county and family photography in MA. Paula Swift has been awarded the Kodak Gallery Award for Photographic Excellence in 2009 and 2013 for her portrait photography work. 2014 Photographer of the Year by the Professional Photographers of America International Photographic Competition Bronze Medalist. Paula Swift Photography offers Portrait Photography in Boston, MA and surrounding Massachusetts areas. Paula Ferazzi Swift has become the leading Boston Newborn Photographer , Award-winning Boston MA Children's Photographer in Boston and nominated as Boston's Best Family Photographer by Nickelodeon's ParentsConnect. Contact Paula Swift Photography a Metrowest Boston based Photographer to experience lifestyle photography in MA. You will find portraits of children in MA, family photography on the beachs in MA, ME and NH as well as some of the best maternity and newborn portraits in Boston, MA. MA Photographer - Paula Swift Photography, Inc. a Boston Massachusetts Children's and Family Portrait Photographer, Photojournalist and Fine Art Photographer in Metrowest Framingham Massachusetts. Paula Swift's Professional Photography studio is located in the heart of Metrowest Boston. Paula Ferazzi Swift has become Boston's Premiere Newborn and children photographer over the past 15 years. If looking for a Southborough Photographer, a Wellesley Children's Photographer, a Sudbury Family Photographer or the Best Boston Photographer Paula Swift Photography is the photographer for you. One of the few Master Photographer and Certified Professional Photographers in Boston Metrowest. You will see the difference when you hire a professional photographer who has pride in education and continous growth in her craft. 2019 Member of Professional Photographers of America, Inc.
Paula is an award-winning Boston Children's photographer and photojournalist offering unique, lifestyle portraits. Paula offers a professional photography studio in Sudbury, MA and works on location throughout Metrowest Boston, Central Massachusetts, Boston and Worcester County. Paula is a proud member of the Professional Photographers of America, Inc. and Professional Photographers Association of Massachusetts. Please contact Paula for her Editorial, Commercial and Corporate rates. Outdoor Boston Newborn Photographer: Paula Swift Photography offers outdoor session for your new baby in Boston, Metrowest, Brookline, Worcester and surrounding areas. On Location Newborn Photographer: Paula Swift Photography offers beautiful Boston newborn photography sessions in your Boston home, in the comfort of your house in Wellesley or any home in the Metrowest , North Shore, South Shore and Central Massachusetts areas. Please plan ahead and book your session while you are still pregnant so your new baby can be photographed 7-14 days old, which is the prime time for those sleepy newborn poses. Framingham Photographer : Paula Swift Photography is an award-winning Framingham - Sudbury Photographer. As a Master Photographer and Certified Professional Photographer, Paula Swift offers the most versatile photography with her creativity and professionalism throughout her photography sessions. Boston Maternity Photographer: Paula Swift Photography offers beautiful and professinally lit maternity and pregnancy portraits for you. Come to her Metrowest Photo Studio have them taken outside or in the comfort of your Boston area home. Pregnancy Portraits are such a great way to remember the very beginning of your family. Boston Children's Photographer MA : Paula Swift Photography offers fun and unique Boston Children's Photography in her fun and unique photography studio loft located in Metrowest Boston Framingham , outdoors at local parks, beaches or in the comfort of your home. Professionally trained as a photographer and photojournalist has taught Paula Ferazzi Swift how to capture children on the go. Being a mother of 3 children has enabled Paula Swift to make children very comfortable during their Boston Outdoor Child Photographer sessions. Offering sessions for children in Framingham, Boston, Metrowest, Worcester and Southern Maine Paula will capture the essence of your child if you are looking for a Boston Children's Photographer. An award-winning international and national child photographer, Paula has the best versality from newborns to high school seniors throughout her portrait photography work. Offering her Lifestyle Photography outdoors or in beautiful Sudbury Photography Studio. Boston Family Photographer: Paula Swift Photography voted Best Boston Family Photographer offers family photography sessions in Framingham, Boston, Metrowest, Brookline, Worcester, Wellesley, Weston, Southborough, Sudbury and Wayland. If you are looking for a Boston Family Photographer Paula Swift Photography is the best photographer for your family. Paula's experience as an award winning photojournalist has taught her how to capture children on the go and fun, unique lifestye family photography sessions. Offering the most diverse porfolio in Boston amongst photographers in the area. Sudbury Family Photographer: Paula Swift Photography, Inc studio is located in Sudbury at 730 Boston Post Road. If you are looking for a Sudbury Family Photographer Paula Swift Photography, Inc. is the best photographer for your family. Paula's experience as an award winning photojournalist has taught her how to capture children on the go and fun, unique lifestye family photography sessions. Wayland Photographer MA : If you are looking for a Wayland Photographer MA, Paula Feraazi Swift is the photographer for your children and family. Paula's experience as an award winning photojournalist and portrait photographer for over 23 years has taught her how to capture children on the go and fun, unique lifestye family photography sessions. Offering photography sessions in Wayland, Weston, Sudbury, Lincoln, Concord, Framingham, Wellesley and Natick. 1995-2019 � Paula Ferazzi Swift and/or Paula Swift Photography, including website ,images and all text . Images may not be used or reproduced in any form without written consent from Paula Swift. This website and text are monitored by Copyscape. Paula Swift Photography, Inc., a Master Photographer, Photographic Craftsman and a Certified Professional Photographer with portrait studio located in Sudbury, Massachusetts, travels throughout Southern New England, New Hampshire, Connecticut, Maine, Rhode Island. Paula Swift Photography, Inc. travels throughout Metrowest, Boston, Worcester, Framingham, Natick, Sudbury, Wellesley, Wayland, Southboro, Southborough, Northboro, Northborough, Shrewsbury, Westboro, Westborough, Millis, Medfield, Brookline, Somerville, Medford, Reading, Waltham, Wilmington, Woburn, Dracut, Groton, Littleton, Mendon, Milford, Hopedale, Uxbridge, Northbridge, www.paulaswift.com , Millbury, Auburn, Sutton, Sturbridge, Charlton, Holden, Rutland,top, Norwood, Quincy, Dedham, West Roxbury, Stoughton, Dover, Ocean Park, ME, Old Orchard Beach, ME, Concord, Acton, Ayer, Westford, Bellingham, Franklin, Hopkinton, Leicester, Spencer, Rochdale, Longmeadow, East Longmeadow, Westfield, Springfield, Forest Park, Wayside Inn, Sherborn, Marlboro, Marlborough, Hudson, Bolton, Berlin, Princeton, Boylston, West Boylston, Arlington, Lexington, Burlington, Weston, Braintree, Ashland, Upton, Holliston, Stoneham, Jamaica Plain, South Boston, East Boston, Blackstone, Douglas, DO NOT COPY THIS! Leicester, foto, Barre, Leominster, www.paulaswift.com , Sterling, Fitchburg, Gardner, North Brookfield, Spencer, Brookfield, East Brookfield, Bedford, Andover, North Andover, Billerica, Boxboro, Canton, Carlisle, Chelmsford, Concord, Harvard, Holden, Holbrook, Norwell, Lincoln, Lunenburg, Lynnfield, Maynard, Needham, North Reading, Norton, Oxford, Plymouth, Randolph, Stowe, Tewksbury, Topsfield, Wakefield, Walpole, West Roxbury, Winchester, Wrentham, Rockland, Milton, Norfolk, Cambridge, Watertown, Newtown, Chestnut Hill, Beacon Hill, Back Bay, Douglas, Beverly, Mansfield, Swampscott, North Shore, South Shore, Malden, Central Massachusetts, East Walpole, Southbridge, Attleboro, North Attleboro, Sharon , Weston, Salem, Beverly, MA Beach Sessions, Mattapoiset, Lowell, Boxborough, Leominster, Lancaster, Lunenburg, Townsend, Fitchburg, Wellesley Hills, Rochdale, Rockdale, Upton, Grafton, North Grafton, Norwell, Brighton, Allston, Cambridge, Hingham, Rockport, Boxford, Arlington Heights, Brighton, Belmont, Roslindale, typoe, Winchester, Mattapan, Lynn, Winthrop, Chelsea, Revere, Newburyport, Cape Cod, Nashua, and MA, NH, Mass, CT, RI and ME. If you are looking for a children's photographer in MA or Boston Paula Swift Photography is the best photographer for you. Are you looking for Boston Baby Photographer or Maternity Portraits in MA,then Paula Swift Photography, Inc. of Framingham and Wayland MA is the photographer for you. Award winning lifestyle photography by a true working Photojournalist. Paula Swift is an award winning photojournalist in the Boston area and Massachusetts. If you are a photographer and deicde to copy this text, my site is monitored by copyscape, copysentry will find out. Please use your own unique wording. Paula will come to your home to capture your family portraits, baby photos in Boston, newborn photography in Metrowest. When choosing a professional photographer in the Boston area make sure they have the experience, versatility, and expertise as a professional photographer. Family Portrait Photographer in Boston and Metrowest, Paula Swift Photography captures the fun dynamics of your family through unique photos you will cherish always. Do you have twins or triplets..Paula Swift Photography, Inc. has been capturing multiples in the Boston area for years. Paula loves to offer Fine Art portraits of your children and family. If your looking for a newborn photographer or maternity photographer in Massachusetts or New England, visit the Award- Winning Paula Swift Photography, Inc of Sudbury, MA for more information. Central Masachusetts, Metrowest Boston, Worcester County Portrait Photographer and Middlesex County portrait photographer, serving Massachusetts towns with portrait photography Paula Ferazzi Swift travels to Berlin, Bolton, Braintree, Quincy, Boston, Boylston, Brookfield, Charlton, Clinton, Cambridge, Sudbury, Dover, Sherborn, Framingham, Grafton, Harvard, Holden, Hopedale, Holliston, Hopkinton, Hingham, Lancaster, Leicester, Leominster, Lunenburg, Maynard, Mendon, Milford, Millbury, Millville, Milford, Natick, Newton, Needham, Northborough, Northbridge, Whitinsville, Paxton, Princeton, Rochdale, Rockland, Rutland, Shrewsbury, Southborough, Sterling, Sturbridge, Sutton , Fiskdale, Sutton, Upton, Uxbridge, Watertown, , Webster, Wellesley, Weston, West Boylston, Westborough, Westminster, Winchendon, Wareham, Weymouth, Worcester, Wrentham for maternity, newborn, children and family portrait photography. Also creating unique newborn, children, maternity, and family lifestyle photographs in Framingham, Natick, Shrewsbury, Boston, Cambridge, Taunton, Wayland, Westwood, Weston, Sharon, Ashland, Hudson, Hopkinton, Franklin, Wrentham, Norwood, Arlington, Lexington, Concord, Wellesley, Needham, Weston.Paula Ferazzi also travels to her hometown of Longmeadow, Massachusetts and throughout other areas in Central Massachusetts the South Shore, Metrowest Boston, Boston and Cape Cod for newborn, maternity, baby, children, and family portrait photography. Paula Swift Photography offers award winning beach portraits in MA, Cape Cod and Southern Maine in the summer months. Paula Swift Photography offers children, senior, and family sessions to families in Boston, MA . Contact Paula Swift at Paula Swift Photography in Sudbury and Framingham, Massachusetts if you are looking for session for your twins or triplets. Paula is a twins photographer and takes photos of triplets, while offering portraits of twins and triplets children, please visit her galleries and blog for examples of twins and triplets. Is your family looking for a beach session in Boston or a beach session on Cape Cod, contact Paula Swift Photographer www.paulaswift.com for her rates. Offers Family sessions in Maynard which were photographed at the Wayside Inn Mill. Paula Swift Photography travels to Cape Cod for a travel fee. You will find many beautiful captures by Paula, sleepy newborns, children at play and families enjoying a day at the park. Are you looking for a sunset beach session in Maine or MA. Paula captures beautiful unique portraits of families on the beach, beach portraits in MA, Cape Cod beach portraits, north shore beach portraits and south shore beach portraits. Unique newborn photography and portraits, using patience to capture beautiful sleeping newborn photos because she is a mom herself and has 3 sons. Paula is a local photographer in the Metrowest located in Framingham and offers a professional studio in Sudbury, MA. Paula Swift Photography,Inc offers artistic newborn portraits in Mass, MA and Massachusetts. TAGS: Boston Photographer, Boston Newborn Photographer , Award-winning photographer, Sudbury Photographer, Wellesley Photographer, Paula Swift Photography, Wayland Photographer, Southborough Photographer, Framingham Photographer, Master Photographer, Certified Professional Photographer, MA High School Senior Photographer, Boston Children's Photographer, Photography Studio Boston Metrowest, Outdoor Family Photographer, Beach Photographer MA, Photojournalist, Lifestyle Photographer, Family Photography and Engagement Photographer.